Deflate All 4 Tires At Once! No one likes wasting time squatting down and running from tire to tire trying to set each tire to the correct PSI for maximum off-road traction. If you frequently air down to different pressures and want to eliminate the calibration process, then J.T. 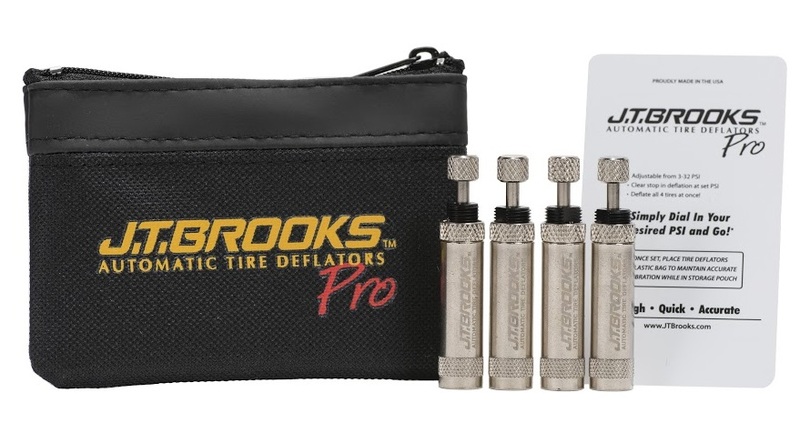 Brooks Automatic Tire Deflators Pro are exactly what you need. We have eliminated the need to calibrate each automatic tire deflator using a tire that has been deflated to the desired PSI. Simply use our precision laser engraved scale to dial in your desired PSI and go! 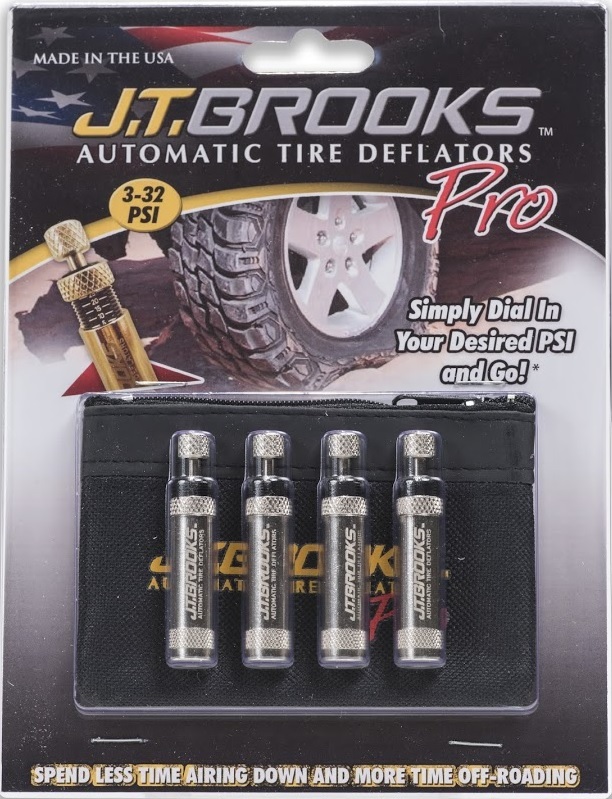 * These deflators will automatically and accurately deflate your tires to a set PSI. Once you dial in your PSI, simply lock the tire deflators in place with the lock nut, screw them onto each tire's valve stem, and let them do the work. 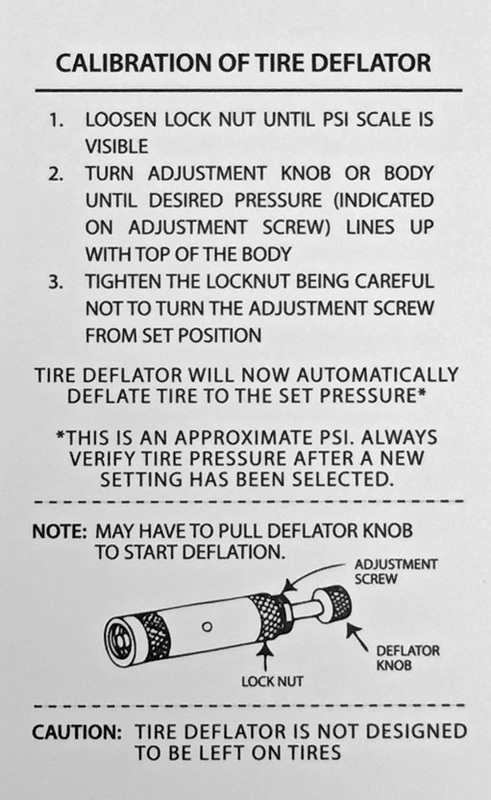 The deflators will automatically shut off when the desired PSI is reached. By screwing one deflator on to each tire, all tires can be deflated simultaneously. This allows the user to complete other tasks while all tires are deflating. The automatic feature of these valves eliminates the need to manually deflate your tires, so you spend less time setting your tire pressure and more time off-road. *This is an approximate PSI. Always verify tire pressure after a new setting has been selected. arrived very quickly and ver solid, well built deflators. Were very easy to set and won't have to set them again. Can't drive in the dunes this time of year so haven't put them on tires to test yet, but due to quality, don't think there will be a problem. ProsEasy to set to tire pressure you want to go down to and only have to do it once.